As a patient, your diagnosis and treatment should meet a reasonable standard of care. When your healthcare provider breaches that standard of care and you suffer injury as a result, medical malpractice may have occurred and you may be entitled to significant compensation for medical expenses, lost wages and related damages. The best way to learn if you have cause to file a medical malpractice lawsuit in New Jersey is through a confidential consultation at Kline & Specter. During your free consultation, we will review your case, discuss your options and help you determine the most effective way to move forward. Kline & Specter is the only law firm in the United States with five attorneys on staff who are also medical doctors. This gives us a tremendous advantage in the investigation and litigation of medical malpractice claims. 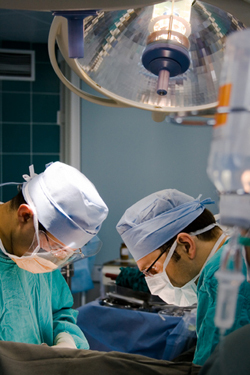 Our lawyers represent victims of medical malpractice throughout the state of New Jersey. Any medical professional can commit malpractice. Physicians, nurses, support staff, literally anyone involved directly or indirectly with patient care may be liable for damages. This is just one reason you need an experienced medical negligence attorney on your side. Not only will our attorneys work to identify each liable party, we will endeavor to hold them accountable for your injuries and fight for the full compensation you deserve. Our medical malpractice lawyers have achieved exceptional results for victims of negligent healthcare providers. Among these is the largest ever medical malpractice verdict in Pennsylvania, a $100 million verdict for a baby who suffered severe brain damage due to medical malpractice. We have substantial experience handling issues such as birth injury, including one New Jersey case that settled for $15 million, as well as less common and more complex cases such as patient incapacitation following unauthorized experimental treatments, litigation that resulted in an $11.3 million settlement. Among many other multimillion dollar medical malpractice verdicts and settlements in New Jersey were a $10 million settlement for a boy who suffered a severe allergic reaction and a $5.8 million verdict for a woman who was given the wrong anti-malaria medication. We would be happy to review your case and discuss its potential value with you. Not only is the burden of proof in medical malpractice cases on the victim, companies and professionals within the healthcare industry have access to attorneys and insurance teams with expertise representing those accused of negligence. Following a malpractice claim, entities working on behalf of the healthcare professional implicated typically spring into action, working to avoid any liability or to settle quickly and quietly by coercing victims into taking less than fair compensation. Our attorneys can help protect you against the predatory tactics of both insurance companies and health industry legal teams while building your case and fighting for your rights. Protect your interests by working with some of the most successful medical malpractice lawyers in the country. The statute of limitations for medical malpractice lawsuits in New Jersey is two years from the date an injury took place. If your injury was not discovered immediately, you may have two years from the date of discovery to take action. In cases of birth injury, you may have until the child’s 13th birthday to file suit. While you may have some time following injury to file suit, the sooner you act, the better your chances of a successful claim. If you have been injured or a loved one has been killed through medical negligence, please get in touch with our attorneys as soon as possible to schedule your free consultation.